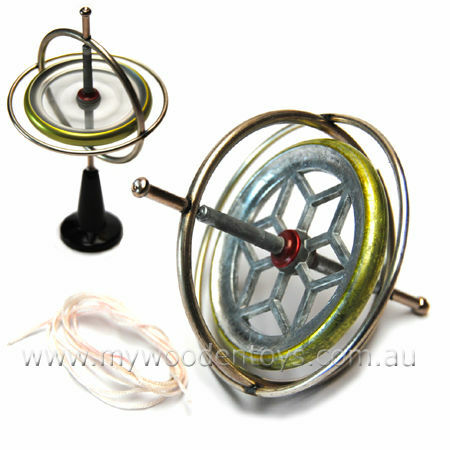 Gyroscope Traditional Toy by Tedco is a classic educational toy which has entertained and taught for many generations. This Gyroscope comes with a plastic base string and full instructions and suggestions. Once you have a gyroscope spinning it can balance easily on the point of a pencil, edge of a glass and even on a pice of thin string. This is a truly fascinating toy and finds its way into our shop because I simply love them! Size: 10 cm high 7.5cm diameter. Material: Metal Gyroscope, Nylon thread, Plastic Base. Age: 3+ but recommended for older children. We like this because: "Does so many interesting tricks."